Be the first to share your favorite memory, photo or story of Ronald. This memorial page is dedicated for family, friends and future generations to celebrate the life of their loved one. 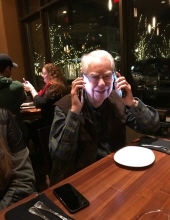 Ronald D. Brace, age 86; beloved husband of the late Marlys R. Brace, nee Seefeld; dear father of Nancy (Paul) Kruk; fond uncle of many nieces and nephews. Visitation, Friday, February 15th, 3:00 p.m. until 8:00 p.m. Funeral service, Saturday, February 16th, 10:00 a.m. from Adams-Winterfield and Sullivan Funeral Home, 4343 Main Street (1 Blk. So. of Ogden Ave.), Downers Grove, IL 60515. Interment, Naperville Cemetery. 630-968-1000 or www.adamswinterfieldsullivan.com. To send flowers or a remembrance gift to the family of Ronald D. Brace, please visit our Tribute Store. "Email Address" would like to share the life celebration of Ronald D. Brace. Click on the "link" to go to share a favorite memory or leave a condolence message for the family.